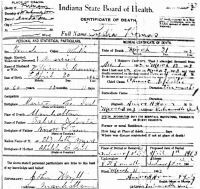 Born 21 Apr 1842 Indiana, U.S.A.
Died 31 Mar 1903 Manhattan, Putnam County, Indiana, U.S.A.
Indiana Deaths, 1882-1920: "Lydia Thomas, age 60 b. Abt. 1843, d. 31 Mar 1903 Manhattan, Putnam County." Married 24 Jan 1877 Marion County, Indiana, U.S.A.
Indiana Marriage Collection, 1800-1941: "Lydia M. Sylvester, age 14 [sic; 34] b. Abt. 1843, & William S. Thomas, m. 24 Jan 1877 Marion County." Born - 21 Apr 1842 - Indiana, U.S.A.
Married - 24 Jan 1877 - Marion County, Indiana, U.S.A.
Died - 31 Mar 1903 - Manhattan, Putnam County, Indiana, U.S.A.